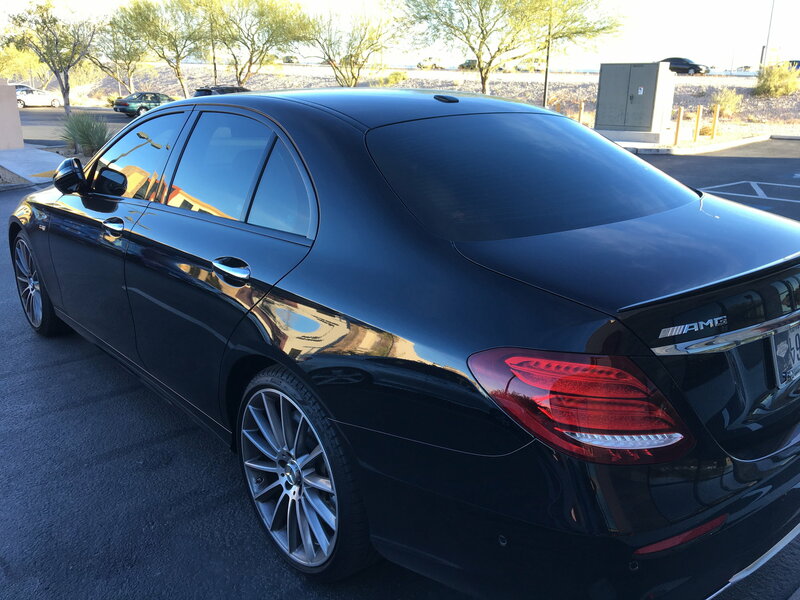 Yesterday while commenting on options being left off of ordered vehicles here, I posted a pic of my E43 as it was missing the Pano roof due to manufacturing constraints. I did not notice that someone had vandalized my car that afternoon while visiting one of clients in a very upscale area in Las Vegas. 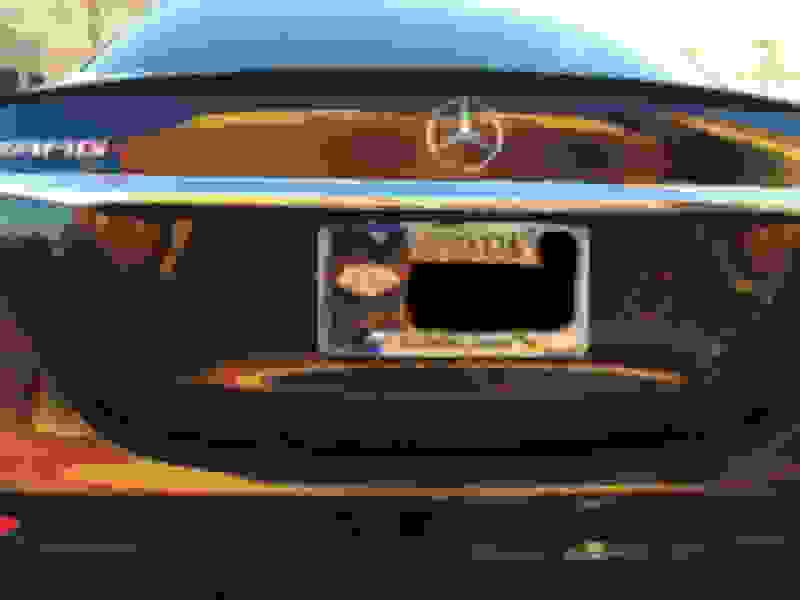 If you look closely at the first image you will see the dent below the AMG badge. When I left my client it was dark so I did not see any damage until the following morning. I'm so pissed as this happened only seven months into ownership. In fact I didn't even make it to my client appointment...I went directly to the body shop for an estimate, then directly home and put her in the garage where I know she is safe. Had to pull out the old school 2004 C230 sport as I cannot bring myself to drive the E43 in her current state. Please be careful where you park your cars. One thing I can say about all of us on this forum is that we take pride in or cars. Unfortunately there will always be haters and they do things to our cars like this. Last edited by ELove; 11-10-2017 at 05:39 PM. I wonder what satisfaction anyone gets out of doing crap like this. If it's kids, it's mischief. More often than not it's an adult underachiever with contempt for anyone that has any degree of success. Sorry for your loss. If it's any consolation, black is the easiest to repair like new. That stinks. So sorry to see the damage. Fantastic looking car, by the way. Hope the damage is easily fixed and you can get back to enjoying it. Some people don't deserve to breathe. I have seen people, young and old who deliberately vandalize other cars and my car. This is my nightmare scenario I’m sorry . I always thought something like this would trigger alarms from the car ? Why didn’t they go off ? I feel your pain man. one o the reasons I have 4 dashcams in my car. It’s my understanding that the alarm will trigger for glass breakage, forcing a door open or towing. I’m not 100% certain of all the trigger variables however my damage would only trigger very sensitive custom alarms that detect minimal vibration or impact. This should be fixed with the blood of the guy who did that. You certainly have my vote! Insurance should cover the repairs. Mean, jealous, underachievers. That is very unsettling, but soon it will be well. Yeah I know but that just them a reason to hike up my future premium. I think vandal damage is like a windshield claim, it does not affect future premiums. I usually freak out over my first door ding. This would have sent me over the edge. The locations of the damage seem so random. What do you think they used? You may want to talk to property management there - they may be aware of other incidents or if not they should be. What the F is wrong with some bloody C’s . Honestly, peoples jealousy really needs to stop. I am a hard working person and i haven’t ever had a hand out and i have nice car/s as a reward for myself for doing well - i started working in a housekeeping department in a Hotel many years ago and have worked up from there. It really Ps me off that people do this stuff. You will be pleased to note that in the next E coupe , and E update there will be a text message sent to you when someone even bumps your car. Insurance will cover the repairs but it is not considered a comprehensive claim, which is typically limited to glass breakage and has a very small if not zero deductible. The body shop thinks its was definitely not an 'accident' and says it was a heavy blunt object. I spoke with property management on Friday and made them aware of the situation and they say the are unaware of anything like this happening prior. Unfortunately there are no exterior cameras on any of the buildings in this complex. But that is going to change this week as my client is having exterior cameras installed on their building. He drives and Aston Martin Vanquish and a few other exotics and would hate for this sort of nonsense to continue without catching the culprit(s). That really stinks. A number of years ago, I had a just purchased a brand new 911 cabriolet. One week into my ownership, I took her out of town to play in a golf tournament. I spent the night in a nice hotel, in a small town in rural MS. The next morning, on my way out to my car, I noticed a small ding on the drivers side door. As I looked closer, I noticed every exterior panel had been keyed !!! I had her repainted, but the value dropped by 1/3 overnight. I decided then and there, I would never pay cash for another luxury car, lease only. I wound up keeping it for a few months, and ordering a new one, which in retrospect was kinda dumb. The good news, is that there was no harm done to you or your family! She will look brand new when the body shop gets through with her. Don’t make the mistake I did years ago, and trade it. Keep and drive it! It’s an awesome car I’m sure. the person's probably already gone.